I have been working on my social media profile for a few weeks now. I have a Google+ account, with a page for TDI, an Instagram account and most recently a LinkedIn account and now Twitter. I am in the process of getting to know the strengths and weaknesses of these, how they work, and how best to engage with them and will be linking. 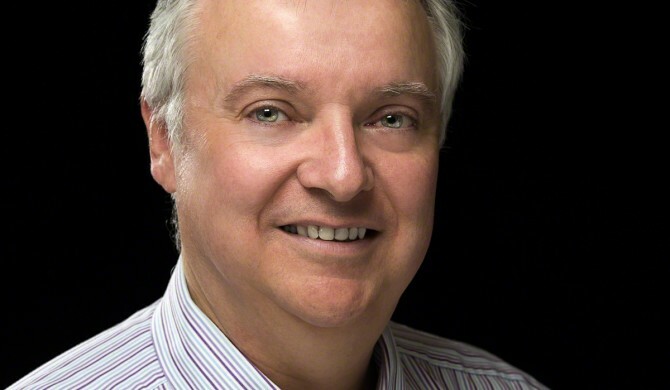 My LinkedIn account is really to support my other career as a psychiatrist but I have previously used the same (branding) image as for TDI and my other accounts. Thinking that I probably need something a little more formal, my wife agreed to help me take a fresh portrait for LinkedIn. Towards the end of last year our built in Fridge-Freezer decided that it would start freezing everything in the fridge, as well as the freezer, and to make so much ice that the drawers in the freezer wouldn’t open at all. Fearing a fire, and not having enough time to source a reasonably priced built in unit, or re-fit it in the appropriate cupboard, we elected to have a free-standing unit instead. In fairness this has been a great success, my daughter has decorated it with magnets, and uses it as a noticeboard for maths puzzles for her poor old dad to write down and solve. But here’s the rub. I can’t easily move the kitchen table out to the side like I used to, because a third of that space is now Fridge-Freezer!! 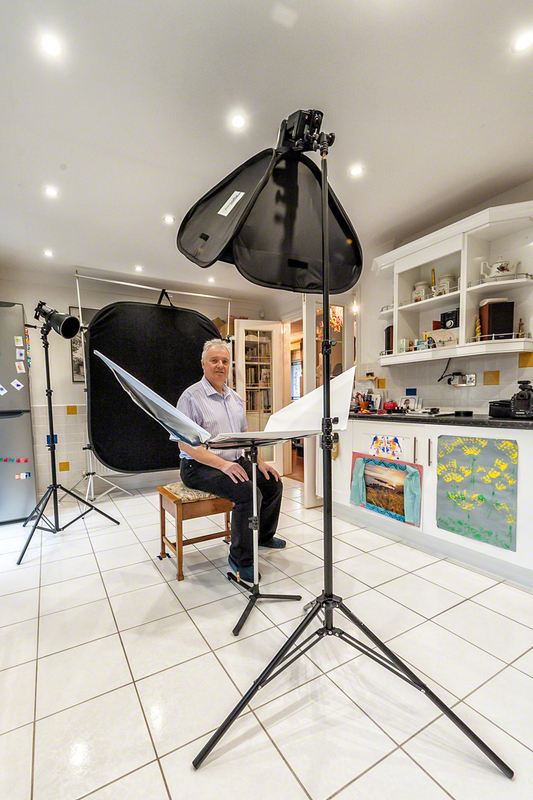 So using the kitchen as a studio to capture a new profile photo is a world more grief than it used to be. Still, I needed some exercise because the weather had trashed our planned cycle ride today (too much ice this morning, too much rain and gale force winds this afternoon). Plus my bike’s not well at the moment either. So moving a heavy table and running up and down stairs a lot seemed just the ticket. The Area to Clear, Ho Hum.. So here’s the thing, that kitchen table had to go out in the hallway. Would it go out through the doors? Could we lift it? If it was out in the hallway, could we get back in the kitchen? Was I going to be able to carry my equipment from upstairs past the obstruction? Who knew, we had to give it a try. 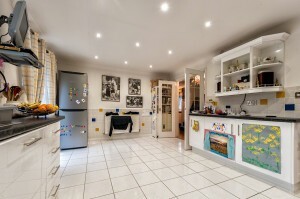 After, that is, Helen had cleaned the floor!! 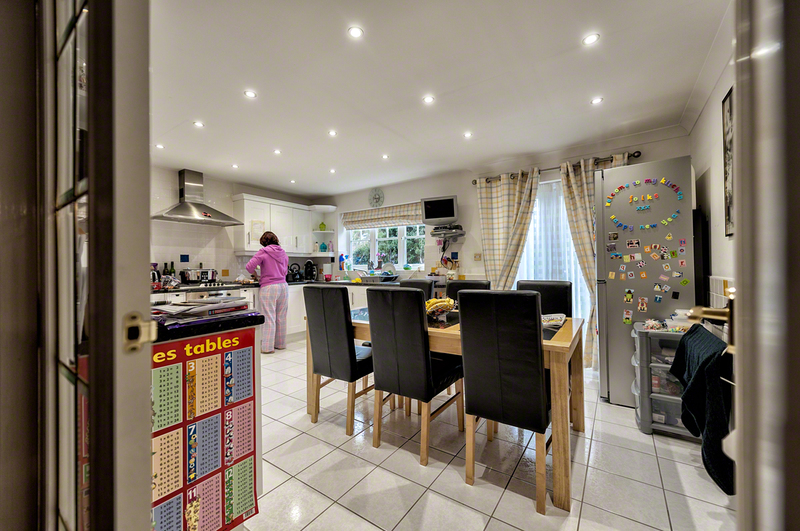 After much shoving and scraping, and even more hoovering and washing, a space was made available in the now pristine cooking and dining area. 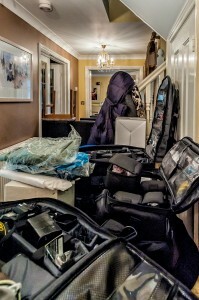 So, whilst Helen moved on to pastures new, for further housework opportunities, I set about bringing the necessary equipment downstairs, and stockpiling it into the hallway. Hmm.. That’s a bit of a mess you’ve got there thought I. I wonder how long Helen is going to stay patient with you? So onto the setup and test shots. I went with the D4 with 70-200 f2.8. This was going to be quite heavy for Helen, but she was confident that she could manage anything I threw at her. I decided not to shoot tethered. It was just one portrait and the image on the back of the D4, particularly with the 3 channel histogram, was more than sufficient to judge framing and exposure. I used my favorite portrait set-up of the Lastolite Triflector and Nikon Speedlight fired through a Joe McNally Ezybox with soft white interior and 2 layers of diffusion. For separation I used a second speedlight (an old SB800, in SU4 mode at 1/32 power) fired through a Bowens grid-spot attached via the rather superb Interfit Strobies XS Int326 gizmo. 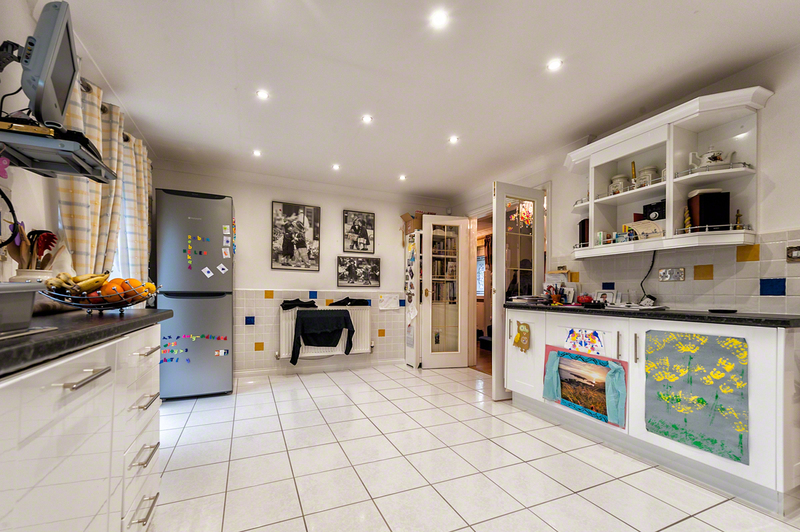 As usual, the camera was connected to the key light using a PocketWizard Flex Mini TT1 and Flex TT5 set up with the AC3 Zone Controller set to -2/3 exposure compensation, with ISO 200, 1/160th second and f8. Finally, my favoured Lastolite black velvet panel, suspended from a suitable stand, completed the picture. So That’s how it’s Done!! 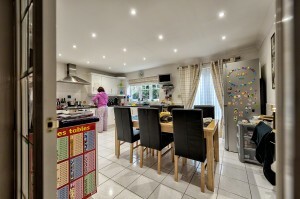 We have daylight balanced LED lighting in our kitchen, so I left those on during the shoot. The only slight problem was teaching Helen to use the back-focus button (I have all my cameras set up this way for my wildlife photography) instead of half pressing the shutter release, but she picked this up really quickly, and didn’t need reminding to focus on the forward eye. 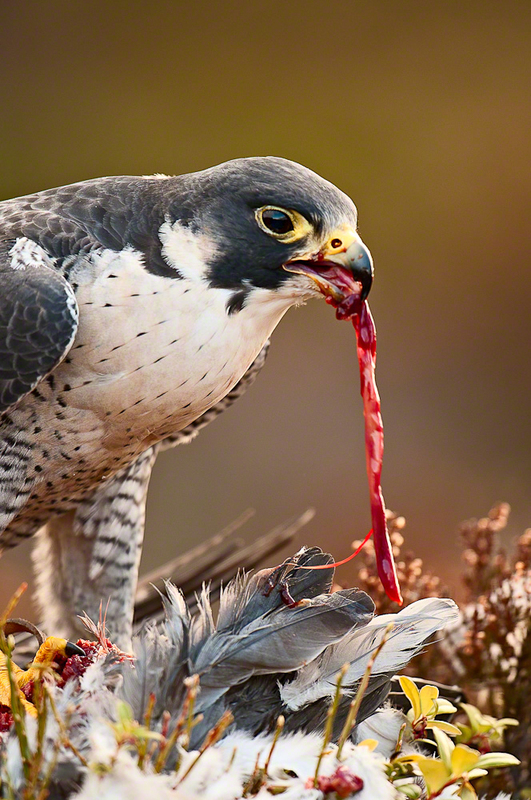 The Peregrine Falcon (Falcon peregrinus) is eating a Wood Pigeon. The picture is at the same time disgustingly savage causing you to want to avert your gaze, whilst also, being eerily compelling. 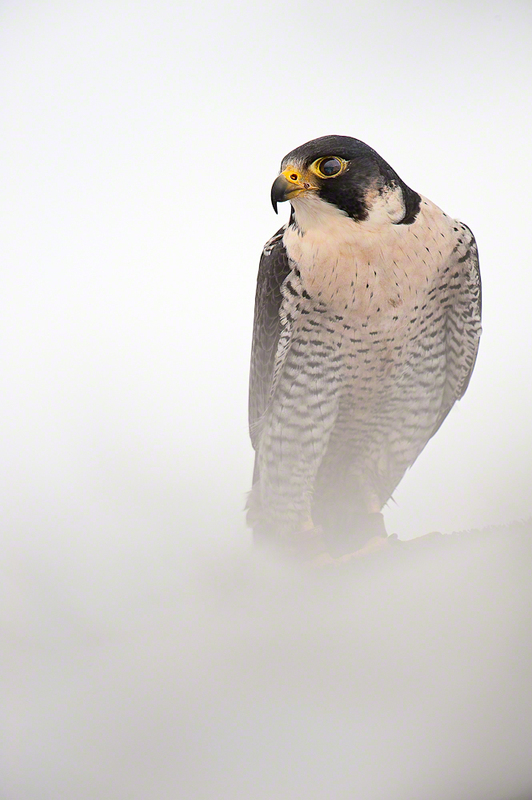 Peregrines can be seen all year round in UK uplands and rocky sea cliffs. They eat medium sized birds such as small ducks and wading birds as well as, of course, pigeons. The Peregrine will occasionally hunt small mammals, small reptiles, or even insects. Reaching sexual maturity at one year, it mates for life and nests in a scrape, normally on cliff edges or in tall man-made structures. The Peregrine, also known sometimes as the Duck Hawk, became an endangered species due to pesticides, notably DDT. Recovery has taken place since the early 1970s as a result of the ban on DDT, the protection of nesting places and releases back in to the wild. For more information take a look at http://en.wikipedia.org/wiki/Peregrine_Falcon and http://www.bbc.co.uk/nature/life/Peregrine_Falcon. 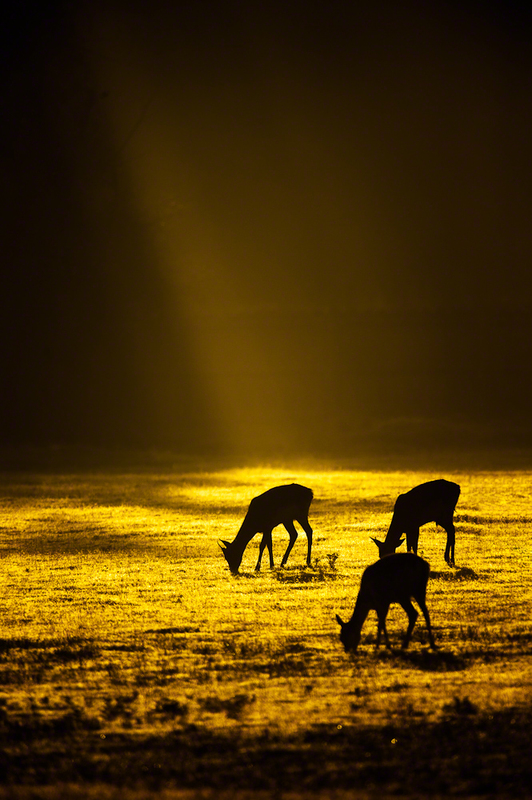 These deer were shot early morning against the light to give this attractive silhouette. There was a small amount of residual mist which effectively displayed the sun’s rays against the trees in the background leading to this terrifically powerful scene. The scene at Bradgate Park, Leicestershire, was one of many opportunities for excellent images. See Bradgate Park for further information on the park and its history. 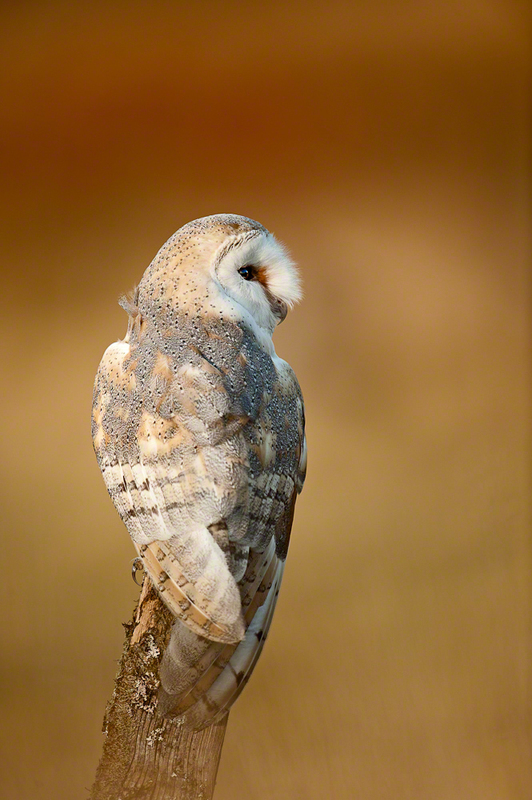 The Barn Owl (Tyto alba) is one of the most widely distributed birds. Smaller than a Tawny Owl, it has a heart shaped face that can change shape. The flight is slow and low over the ground, often wavering and hovering during hunting. They feed mostly on mice, voles and shrews though sometimes eat small rats. They can generally be found below 300m in farmland, coastal marshes and forest edges. They hunt over grassland, along edges of fields or ditches, verges, river banks and railway embankments. Nests can be found in buildings, hollow trees and cliffs. More information can be found at http://en.wikipedia.org/wiki/Barn_Owl, http://www.bbc.co.uk/nature/life/Barn_Owl and http://www.rspb.org.uk/wildlife/birdguide/name/b/barnowl/index.aspx. A Red Deer Stag during the October rut in 2011. The rut is a period when the biggest and strongest male (stag) rounds up a group of females (hinds) for mating. Certainly all of the other male deer want to do the same, but there are only so many females to go around. To maintain control over a group of females, the stag must constantly drive away rivals. 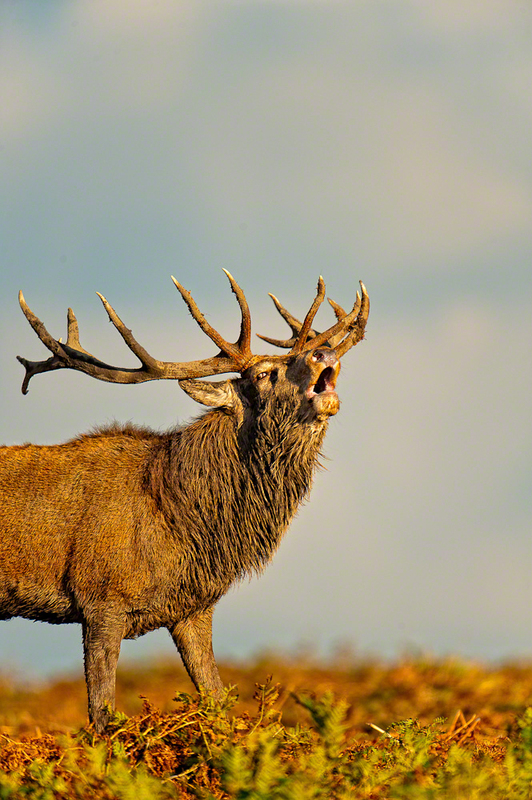 The stag announces his superiority over other males by constantly bellowing out an echoing roar. Sometimes shouting is not enough, so when contenders approach the females they need to chase them off. Sometimes fights between males can break out, and this can lead to some serious clashing of those magnificent antlers, though sometimes the battles are eerily silent and intense. Red deer are our largest native land mammals and can weigh up to 190kg. They are one of only two native species of deer in the UK, the other being the Roe deer. For more information go to http://en.wikipedia.org/wiki/Red_Deer and http://www.bbc.co.uk/nature/life/Red_Deer. This Eurasian Eagle Owl (Bubo bubo) was taken in the Highlands, though is not a native of this area, tending to be distributed sparsely through habitats as diverse as Northern coniferous forest to the edge of large deserts. 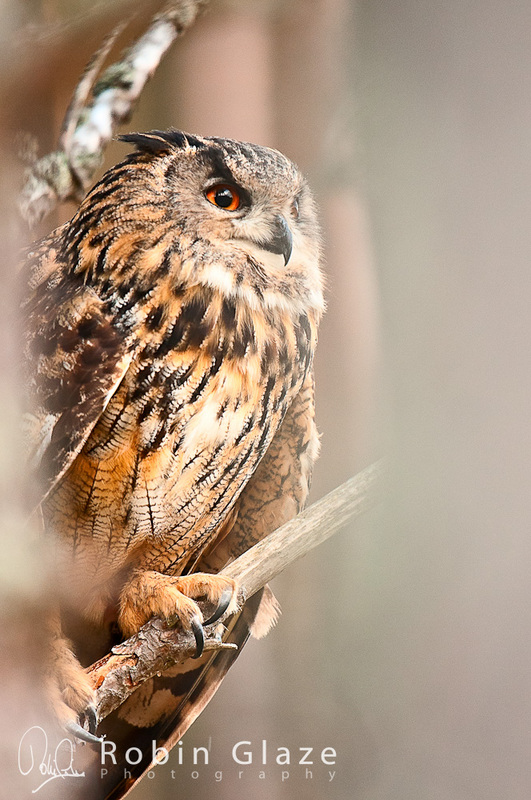 Although rocky cliffs and mountains are favoured, eagle owls have even been observed living in European cities. The shot was taken through a line of trees and features both foreground and background blur. The Eurasion Eagle Owl is one of the largest owls with a wingspan of 138–200 cm (55–79 in) and measures 58–75 cm (23–30 in) long, and in the wild may live for 20 years. They feed mainly on small mammals such as voles and rats, mice and hares. Other birds are also taken including corvids (crows, magpies, etc), grouse, woodpeckers, ducks and geese and seabirds. The Eagle Owl is largely nocturnal and is usually found nesting on cliff ledges. For more information see http://en.wikipedia.org/wiki/Eurasian_Eagle-owl or http://www.bbc.co.uk/nature/life/Eurasian_Eagle-owl. This remains one of my favourite images. Although clearly staged, the haunting loneliness implied by the bleak snowfall still contrasts magnificently with the ruthless and steely falcon eye and beak.